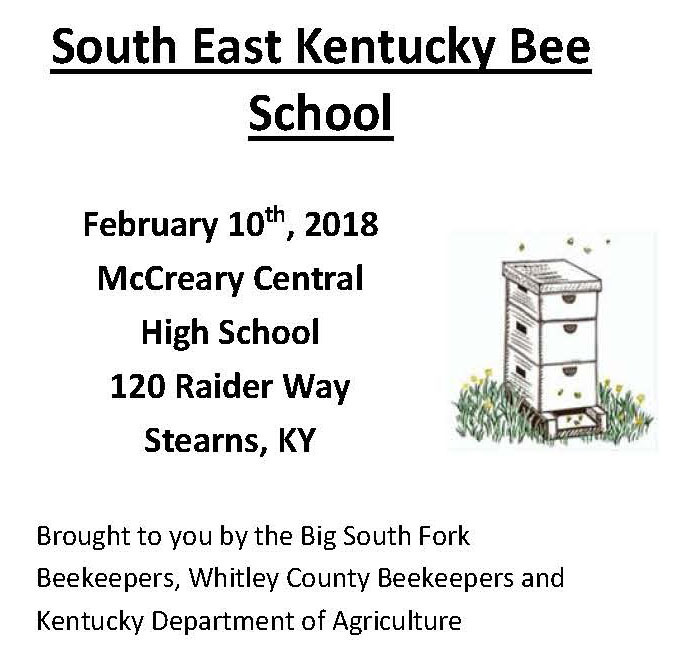 The South East Kentucky Bee School will be held on Saturday, Feb. 10, 2018 at the McCreary Central High School (400 Raider Way Rd, Stearns, KY 42647). Registration will begin at 8:00 a.m. ET. The Opening Session will begin at 9:00 with classes beginning at 10:00. The pre-registration cost is $20.00 per person, couples $35.00. Pre-registration is due February. Registration at the door is $25.00 per person, couples $45.00. High school students and under are free. Contact Greg Whitis at 606-376-2524 or gwhitis@uky.edu for more information or to pre-register.